I almost forgot about the drawing!! HAHA! Congrats to Kerry!!!! YAY! Woohoo! Thanks everyone for entering the drawing! So, today marks the day--a year ago--when I officially opened WhiMSy love & filled the shop with goodies. It is so fun to look back on my last year & think that I actually got to make stuff & other people bought it. 184 items sold. That is so cool. I look forward to an even more successful year! Thanks to all my customers--you rock! Tomorrow I'll be making cupcakes to complete my goal for March: make cupcakes from scratch. I've got the supplies & ingredients purchased & can't wait to get my cupcake groove on!! I'm off to finish working on a "Happy Birthday" mini tag banner for the shop. All the crafty supplies are spread out. I'm sipping on some tea. I'm munching on some Girl Scout cookies (thin mints & peanut butter cookies if you really wanna know). My girls are quietly playing in the background. Ah, that's a lovely Sunday afternoon to me. Yay me! I am so excited! The perfect accessory to display my cards! Congrats on your etsy anniversary! 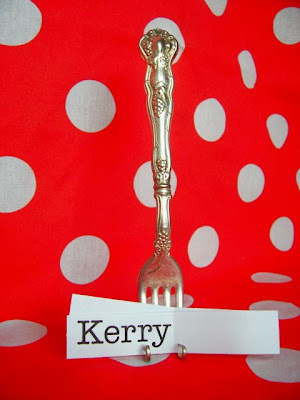 Great picture of the fork easel, I'm loving mine. Happy Cupcake baking! I'm so bummed, I think I forgot to enter this. You seem a little chirpier - are you feeling better? I always bake from scratch, it's not that different from box mixes. Can't wait to see what you do. woohoo Kerry and Nikki, 180 + items is totally amazing Nikki, bi pat on the back you gorgeous goddess of whimsy love. hey nikki - this is the blog of a friend of mine. she owns an online scrapbook store. not relevant, but her latest post has some cupcake love i thought u would enjoy. so glad pazley is doin better - did i say that already??? well done on the banner - u so talanted!! !